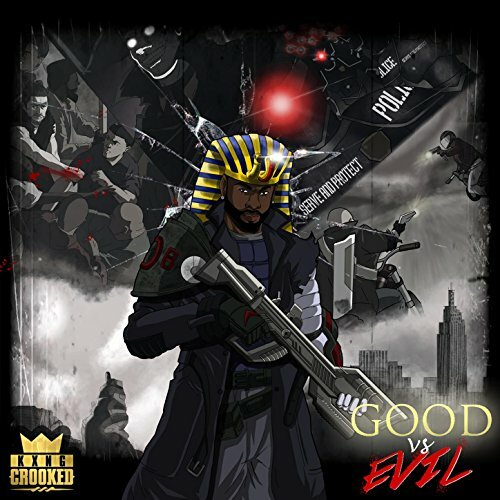 I hope he changes his name back to Crooked I.
tracklist and feats looks good, but that cover? Anyone know why he changed his name in the first place? I always assumed it had something to do with St. Ides having the name "crooked I" trademarked or something. He was below the radar for so long, figured St. Ides just didn't care, but when he joined Slaughterhouse and started blowing up, they put pressure on him for royalties or whatever, and then he changed his name to avoid the hassle. That was my assumption. I think a lot of the name change was to have freedom to release music. I know at one time there was some issues with Treacherous and in getting music released. Ever since the name change this is the 4th or 5th release I believe he has come out with. The cover art is dope in my opinion. This is going to be a concept album, based on what Crooked has said about it in interviews it sounds really interesting. is it gonna come out on CD? Man Crooked I was literally one of my top 3 favorite artist at one point. Amazing how I have no interest in him these days. All I been bumpin (Hip-Hop wise) is Game, Pusha T, Ab-Soul, and old Eminem, Jay-Z, and DMX on Tidal. You still bump those rappers over crook??? that's a you problem.. Eminem dmx.and gay z haven't made a good album in over a.decade. lol, crooked aint made a "good album" on eminem, dmx and jayz level on his whole career. We all know that DMX (even though he is somewhere in my top 50) hasn't been relevant for ages. I have never in my entire life heard someone say "I am so excited for the new Jay-Z album". Eminem is just unlistenable nowadays. On the other hand Crooked keeps releasing fresh content which is never exactly the same as his previous work, so why would we not be looking forward to these tapes he is about to drop? oh, dear stan. crooked never was relevant. he only matters only some deatrowh and lbc, westcoast fan (including me). you never heard bout jayz's excited? Looks his first week sales. Those are the levels of the exciting. so, ok dmx aint rleevant for over a decade, but before? dmx was big once, jay and em still are, but crooked? There goes another one who determines the quality of an album by the number of sales it has. Crooked I is signed to Shady Records as part of Slaughterhouse, is hosting a reality music TV show, not long ago dropped an album with Statik & is a respected MC in the music business. So I would say he is definitely relevant. Crooked aint released one ever. Apex predator is a mixtape. Smh too. Statik kxng is his first real album ever. mixtape? no it wasn't. are you high?? ?